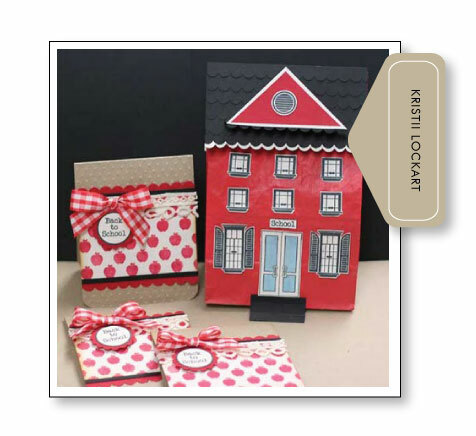 First of all, I want to welcome everyone to the August 2010 Papertrey Ink Blog Hop! It is so exciting to see so many of you here! In honor of school going back into session everywhere, we thought it would be fun to issue a Brown Bag Challenge. We want to see what you can do to dress up, alter, change and ordinary brown lunch bag into a paper crafting work of art. You could modify it to become a gift bag with handles, create a card base by folding it in half (complete with a slide out tag), add a window to it or whatever else you can dream up. After the hop is through, we should have plenty of inspiration to help us create amazing projects with inexpensive brown bags! We look forward to seeing your creations. I have included a Mister Linky list below for you to add your link to your brown bag project. You have until 11:30pm EST tonight (August 25th) to add your link to this list. THREE random participants will be selected to win a FREE Papertrey Ink stamp set of their choice. They will be announced and highlighted here, on my blog, shortly after midnight. We look forward to seeing all of your creations! 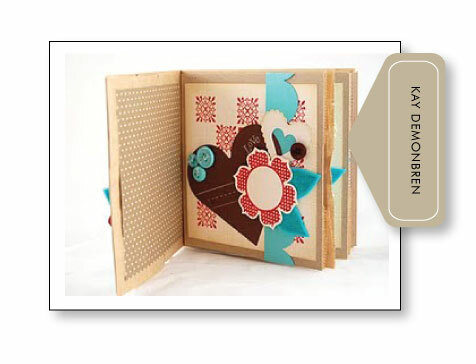 Kay Demonbren created this adorable little mini book made from paper bags. The detail she integrated was amazing and I also loved her fun color scheme. Cassie K used paper bags to create this absolutely stunning flower. 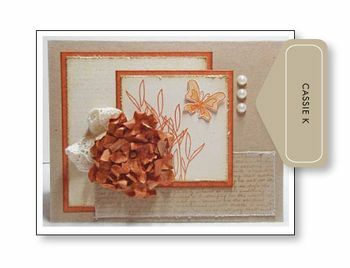 The dimension and style are just beautiful and I loved how it was integrated into her card design. Kristii Lockart transformed a lunchbag into a fun little house, with the folded over flap serving as the roof. I love that she even added the dormer detail to the top to make it look more realistic. Such a fun project and perfect for back to school! The three randomly selected winners above need to contact Customer Service with their free stamp set of choice as well as shipping information in order to claim their prize! Thank you to everyone who played along! This was such a fun blog hop…can’t wait to see all the creativity for this theme! This was a wonderful challenge. There are so many ideas being posted! Love the banner by Jen and the albums too. Great faux ruffled ribbon and pretty flowers! Looking forward to more creative projects. Yahoo…can’t wait to see all the fun inspiration! I am so excited! This is my first PTI blog hop! Can’t wait to see everyone’s projects! This is my first blog hop. It was a challenging project for me, but I really enjoyed it!! Hope everyone has some fun!! Can’t wait to see everyone’s creations! Can’t wait to see all of the projects! I’ve been looking forward to this for the last few weeks!!!! This was lots of fun! I can’t wait to see everyone’s creativity! Thanks for providing so many goodies to play with, I really love my PTI stamps! Nicole, I somehow added my link twice. Is there any way to remove one of them??? What fun, can’t wait to hop around and see…. Hello everyone! This is my first blog hop! I was so excited to use my Leaf Prints set and to make a scrapbook for my twins. I’m looking forward to all these great ideas. Thanks! So fun! Can’t wait to check everyone’s out! Thanks! Can’t wait to check out all the inspiration! This is my first PTI blog hop – such a fun challenge. Now I am off to hop, hop, hop! I finally created a blog so I could participate. I am off to look at all the wonderful creations. Whew, I finally got home to post. Now off to see the wonderful creations. Such an inspiring hop! This was my first time paricipating in a blog hop and I had such a good time. Looking forward to next month! Oh, BTW, I posted Melissa’s post for her, and for some reason the first time it didn’t link correctly, so I linked again. So sorry about that! Can’t wait to see all the creations! I posted Sue Lelli’s link for her project as she was not able to post it before she had to leave for this evening. I told her in reply to her earlier email that I would do that & since she’s apparently not back to do so, I’ve put it up for her. I was unable to complete my project in time, so sadly I’m just an onlooker tonight! Great, great ideas! Love them! You might want to consider removing comment #25. !!!! Thanks for the chance to play!!! Indeed! This is a very exciting blog. I can’t wait to see everyone’s creativity. I know that there are more artists will show their talent. I am going to be inspired again.